As the travel season approaches, with it new aspirations and dreams to realize. The Forever Bloom Alliance with the support of its participants will continue to grow and work towards fulfilling its core objectives of providing service to the community and social development of young people. In striving towards these objectives the association is continuing its FBA Adventravel, an ambitious program aimed at providing members with opportunities to participate in affordable, safe, and unconventional group travel throughout the U.S. and the world. What is Adventravel? Adventravel (Adventure Travel) can be characterized as trips that feature unconventional means of transportation, accommodations, and leisure. More specifically, to get around Adventravelers would make more use of trains, buses, and ferries, as opposed to planes and cabs. Instead of hotels, an Adventraveler would make use of hostels, campgrounds, host families, or any place that is safe and can accommodate a sleeping bag. Instead of spending all leisure time wandering around tourist sights, Adventravel seeks to provide greater contact with local people through volunteerism, teaching, and mutual cooperation. What should you expect from FBA Adventravel? Many of you are familiar with the Spring Break trips I have organized for my students to various places throughout the country. Former students have repeatedly expressed how those trips have had such a continued positive impact on their lives. FBA Adventravel is simply an effort to offer similar experiences designed for high shool and college age students seeking life fulfillment through travel. Just as I did for my middle school students, the association will now take on the role of trip organizer, advisor, and travel guide. So you can’t decide whether or not you or your child should take part in the trip? 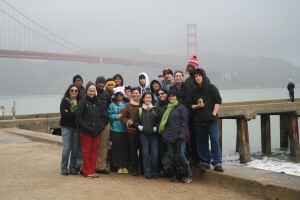 Our projects coordinators and leaders have been arranging trips throughout the country for and abroad for over 10 years. Read the testimonials below what past participants had to say about their experiences during some of our trips planned and led by ADVENTravel project organizers. 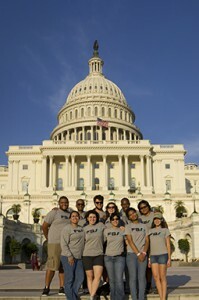 “Extremely, just being introduced to different ways of living and meeting new people affects the way we all think and allows us to escape our societal bubble we experience when living in one place for such a long time.” –2013 Participant to Washington D.C.
“All my trips with FBA give me long-lasting understanding and personal growth.” –2013 Participant to Washington D.C.
“The trip was fantabulously awesome and so worth the money. It was an unforgettable experience.” –Vanessa Perez, 2001 participant to Camp Chatuga, South Carolina. “It was an excellent trip. It’s not everyday a teenager can go to a different state to experience camping and singing around a camp fire.” –Jenipher Rojas, 2001 participant to Camp Chatuga, South Carolina. “The trip was an opportunity as a parent to value both educational and recreational moments with my child.” –Orfilio Borrego, 2001 parent chaperone to Camp Chatuga, South Carolina. “It was the best experience I ever had; it was my very first trip out of Florida, and for the first time, I had finally felt free and that it’s just something I will never forget.” –Melissa Niera, 2003 participant to Camp Montvale, Tennessee. “I got to do things that most people never do in a lifetime, like climb a mountain. I was just amazing.” –Crystal Sebastian, 2003 trip to Camp Montvale, Tennessee. “The trip was one of the most enjoyable experiences I’ve ever had—definitely worth every cent that went towards it.” –Clara Rodriguez, 2004 parent chaperone to Camp Duncan, Chicago, Illinois. “I got to make more friends with other people I didn’t even know were in the school.” –Byron Pellecer, 2004 participant to Camp Duncan, Chicago, Illinois. “I had a great time. It was different because I got to go with my friends and that is what made it all fun.” –Stephanie Guerra, 2004 participant to Camp Duncan, Chicago, Illinois. “This Colorado trip was truly a memorable experience that will forever be in our hearts. We were able to bond with many people we had never approached before and built a really beautiful friendship with one another that made the experience worth while. The funny, the sad, the happy, and mad we shared it all.” –Tani Calderon & Alexia Torres, 2005 participants to the La Foret Conference Center, Colorado Springs, Colorado. “I went on this trip because it truly was a once-in-a-lifetime opportunity. This trip was not only fun, it was an educational experience. It trip gave me time to really think about my life and about what my decisions have been and whether or not they were wise. Altogether it led me to realize various things I never could have imagined. I really recommend for anyone to partake in this kind of experience.” –Alicia Barroso, 2006 participant to the Kanuga Conference Center, Ashville, North Carolina. “This experience has impacted me because it exposed me to new cultures. As a middle school student, I had the opportunity to work side by side with high school and college students, as well as, college graduates. Working with experienced adults who are already set in their careers allowed me to seek the kind of advice and mentoring not even a parent can necessary give.” –Ricky Moraguez, 2010 participant to San Francisco, California. “Absolutely. All my trips with FBA give me long-lasting understanding and personal growth.” — Anonymous 2013 participant to Washington D.C.
“I found the tour ay Antietam to be the most rewarding. It was an amazing experience to sit down with the leaders of the trip and each explain the background of the Civil War. Then visit the battlefield together and reiterate what we had learned about the Civil War earlier in the day.” — Anonymous 2013 participant to Washington D.C.